You don’t have to wait too long to see our Mysti…. 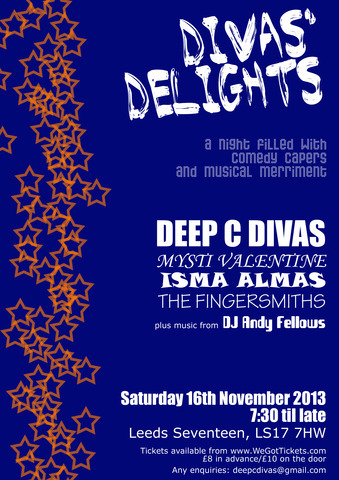 She’s on in Leeds on November 16th! It’s been a long time since we put on a Cabaret, hasn’t it? Well, you don’t have to wait too much longer – we’ve decided we’re going to take you to Heaven on February 7th 2014 at the Trades Club in Hebden Bridge. That’s all we can say, just now, but keep watching this space for news and we’ll let you know all about it! 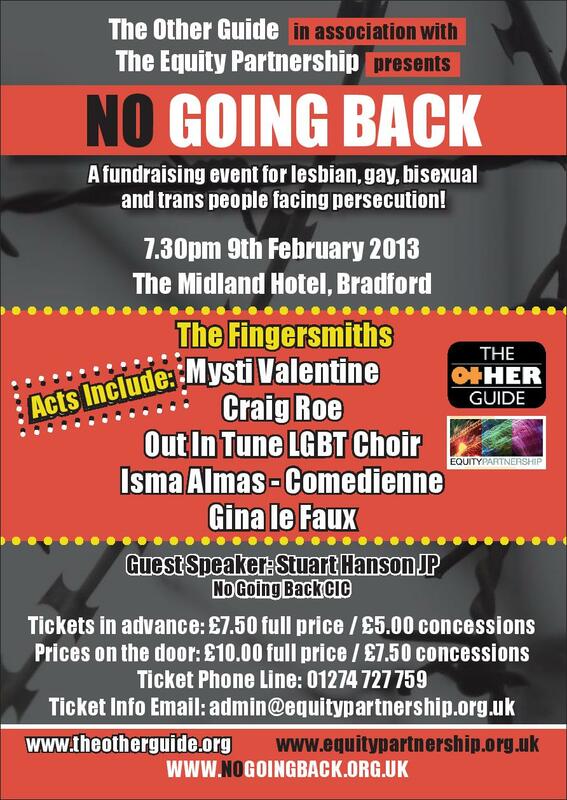 Here’s what our Mysti is hosting in Bradford on 9th Feb. It’s a great cause so we thought we’d mention it here. We’re planning two lovely ‘Christmas Specials’ for 2012. On Friday 21st December we’ll be at Caroline Social Club in Saltaire and on Saturday 22nd we’ll be in Hebden Bridge Trades Club. Hosted by drag goddess Mysti Valentine and your social secretary Bernard Otter, both shows will star Rory Motion. Described by Time Out as “a post hippie comic”, Rory Motion is a gorgeously thoughtful and funny wordsmith, comedian and tree impressionist. He’s has his own series on Radio 4, appeared at every Glastonbury since 1989 and is still producing new and hilarious material. In Saltaire, we’ll also be having a smashing time with Trevor Organ and his plate spinning antics. Plus DJ Dec has got his cheesiest Xmas Disco tunes on standby so you’ll need to bring your dancing shoes! In Hebden Rory will be joined by comedienne Isma Almas who describes herself as “a confused Muslim”. A Funny Women finalist in 2007 she’s described by Chortle as “playful, subversive and intelligent”. Music for dancing will be from the irresistible Ski Band -five fabulous musicians playing calypso, ska/reggae, funk & pop performed with a serious sense of humour. They might even throw in a funked up Xmas tune or two. There’ll be games, surprises and a sack full of fun, so drag your visiting relatives off the sofa and come on down to the party! Does Trevor Organ make you laugh? Trevor Organ has a place in the Harrogate Comedy Festival Comedian of the Year competition.